Do you follow Scott Shuman’s work, aka The Sartorialist? His website chronicles amazing images of people on the street, how they dress and interpret fashion and design in their local context. Here you can view all sorts of street savvy fashionistas, from New York, Berlin, London and Paris. As I watch the people walking and doing life in my local context I have often cause to admire a look, an outfit, the use of colour or an ensemble. But somehow it would seem strange to ask these people, many of whom I know, to take their picture. I have a friend who has great boots, another who sports fabulous coats, the odd Mama who pulls together a “school run” look in such style, a hint of colour to feel fabulous, some jewellery, a great leather bag. A new hair cut or colour. 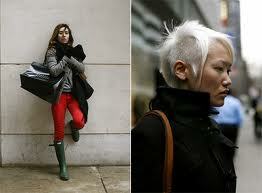 Check out these images: fun hair, great big bags, colour but just a bit and great scarves. Have fun creating your look today. Author Susan BradbeerPosted on May 30, 2012 July 6, 2017 Categories fashion, street dress, The SartorialistLeave a comment on On the Street….